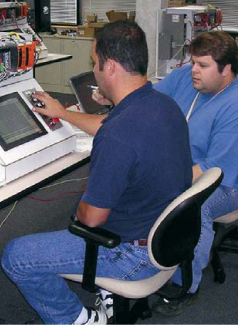 Toll-Free Assistance: Contact our highly trained, skilled engineers at (800) 950-7781. Standard Training: Let us train your engineering group so they can excel. Custom Training: Let us design customized programs for working with unique applications. Trainer Kits: Look to our hands-on learning tools. They’re durable and portable, making them ideal for any setting. Online Training: We provide intuitive presentations and thorough training and product manuals. This is a cost-effective solution for ongoing trianing. Documentation/Online Support: For the information you need, look to our website or our MELDOC-DVD for over 2,000 manuals and CAD files. 24/7/365 Support with ESSP: Under our Extended Support & Service Program, you can reach us on any day at any time. Global Account Management: Our highly trained global account team provides total project management support including engineering, conversion and retrofit services; programming assistance and application development; product/system training; testing, evaluation, validation, network certification services; software maintenance and upgrade programs; documentation services; and special services for SCADA, networking, IT and data management enhancements. Repair Center: Because we constantly upgrade our operation, you can count on getting your equipment back in the shortest possible time. Parts: Our large inventory of parts is available through the Vernon Hills Parts Center, where experienced, trained customer service representatives make sure you get the necessary parts.